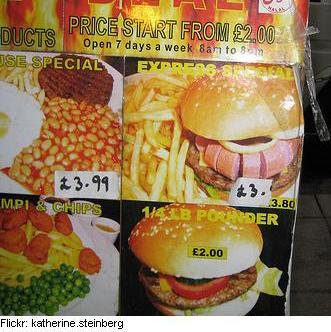 Hamburgers, next to apple pie and statins they’re the ambassadors of American cuisine–for better or for worse–and these harbingers of heart disease might be the baddest of all. 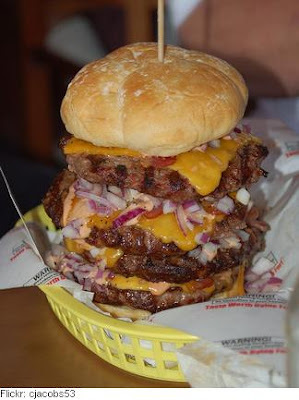 The Quadruple Bypass Burger from the Heart Attack Grill; four burger patties with side orders of Jolt Cola, unfiltered Lucky Strike cigarettes and French fries deep-fried in pure lard. While this burger is definitely going to jack your cholesterol up a few points from all the saturated fat in the 1/4 lber patty, hopefully some of the Omega 3 Fatty acids from the fish (if that really is fish), will help counter off some of the negative effects on your health. This lovely blend of beef and fish comes equipped with 1 1/4 pounder patty, 1 filet of fish patty, numerous slices of cheese, tartar sauce and 3 bun pieces. 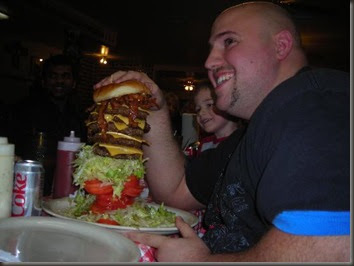 Sonya Thomas, a 5′5 99-pound competitive eating champion, downed an 18 pound Big Daddy Barrick Burger in Las Vegas a few years ago. The Mega Mel Burger might just be the biggest burger to ever walk this planet (Cows walk before they are slaughtered so shut it). The burger contains 1.5 lbs of fresh ground beef, 1 lb of bacon, 1/4 lb of American cheese, lots of lettuce,tomatoes and pickles. 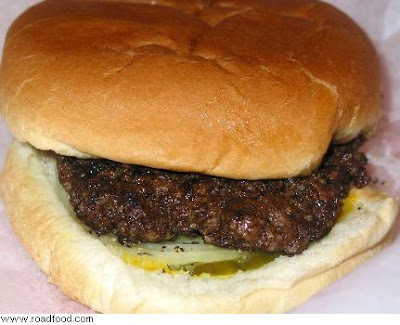 This burger is offered at Mel’s Country Cafe located in Tomball, Texas. 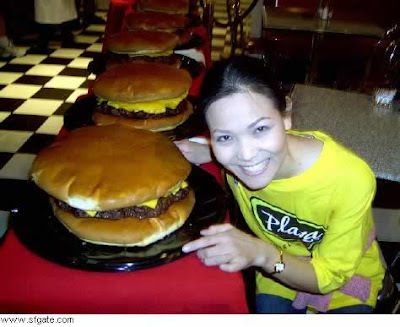 What makes this burger EXTRA special is that if you can finish the ENTIRE thing in two hours, you even get to put your name on the wall! You can have your name in the lights with hundreds of other obese Americans! Just make sure you don’t let anybody pick off your plate or you will be disqualified. This one hails from England. I’m not sure what it’s called, but it’s a hamburger with a chopped hotdog on top. 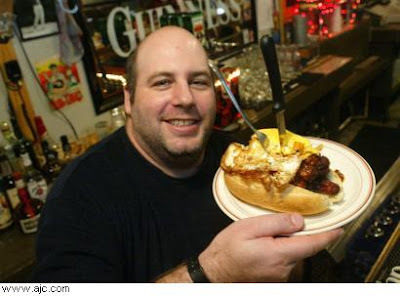 Mulligan’s invented the Hamdog, one hotdog wrapped in a beef patty and cheese, then deep-fried, covered with chili and onions and served on a bun with a fried egg on top. 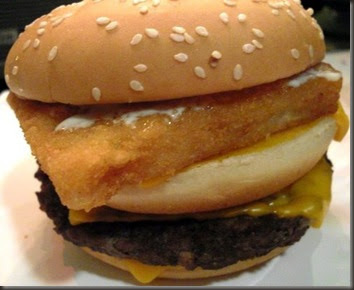 McDonalds has long been ranked the ‘King of Cholesterol’ and this was for the standard foods they offer. 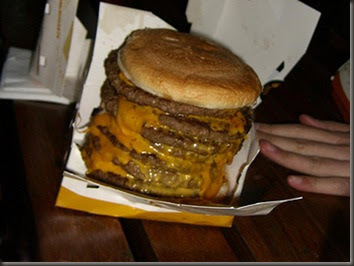 When I saw this picture of a 7 patty 2lbs cheese burger I personally upped their status from King of Cholesterol to Empire. Dyer’s Burgers are deep-fried hamburgers piled with mustard, onion and pickle and paired with a single, double or triple-order of cheese fries. 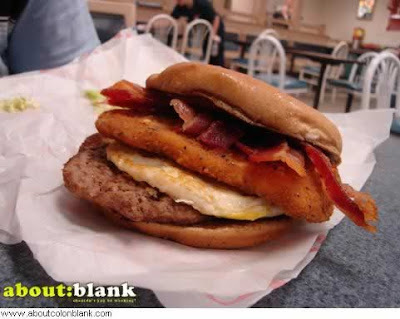 Whataburger puts the entire farm in one sandwich; bacon, cheese, fried egg, burger patty, and chicken cutlet. They affectionately call it the “Whatafarm” burger. Another Mulligan’s creation, the Luther Burger. 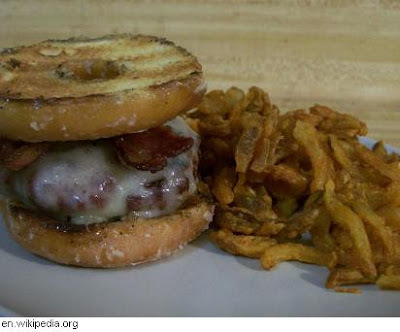 Named after Luther Vandross it’s a bacon cheeseburger sandwiched between two glazed donuts.